The sport shooter's place on the web! After our first visit, we're sold. High quality ranges, equipment, and instruction make for an experience that is among the best available. Our only conclusion about how this happened was that they made one crucial decision early on: they decided to treat the students like customers. Seems simple and obvious, but we've been in situations and heard stories where it was clear that the instructor thought of the students as people in need of what he had to offer. Where the program charged forward and it was a shame if you couldn't keep up. Where there was a restroom, but it was back at the main facility. Where they had some rental gear, but it was limited and mostly stuff someone had grown tired of. Where it was clear the school or instructor didn't realize that they needed the students more than the students needed them. 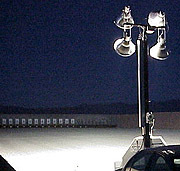 Front Sight is located near Pahrump, Nevada about an hour outside of Las Vegas. It is definitely situated well away from general civilization. There are grand plans for a superb facility that is under construction. At the time of our visit, there was a temporary classroom area, lots of construction equipment, and some nicely appointed ranges. Knowing that the customer is there to learn to shoot, construction of the shooting bays took precedence over other facilities. Nonetheless, the classroom was comfortable and the attached Pro Shop was well appointed, carrying everything from AR-15s (to rent) down to sunscreen and Chapstick (which you'll really want in the desert). The Pro Shop prices weren't bad either. Given you're a long way from an alternative, you're ripe to be gouged (but no one would treat an important customer that way). PMC 9mm ammo was $13/box, Federal American Eagle 45ACP was $19/box, a Blade-Tech belt holster for a 1911 was $55, a PAST Magnum Recoil Pad was $30, ASPI three-point tactical sling was $40, a box of Federal birdshot was $10. The Chapstick was a buck and change. Materials, pens, drinks, snacks and the other niceties that turn a bearable classroom experience into an enjoyable one were everywhere. Each range bay had tables, plenty of seating, overhead cover, a rest room, a hand washing station and drinking water. The range was clean and well cared for. The steel targets were in good shape and the instructors replaced the paper targets frequently. In addition to the standard training ranges, there is a 360-degree range, several "simulator" ranges -- essentially small canyons away from the regular facility where the canyon walls are the "berm", and indoor/underground tunnel systems under construction. There are also housing facilities, commercial facilities and home sites under construction. The two day training class was spread across two days and took nearly all of both days. When you take the two day class, plan on being in town the night before and leaving very late the second day or early the day after the class. Because Front Sight is committed to helping you reach a certain level of competency as well as covering a variety of very important material, there's no good way to shorten this already intense program. The program curriculum is very well developed and is an effective mix of classroom sessions and firearms drills (some dry, some live). Once again, they've obviously considered carefully how to craft an effective class. Just as you're itching to go shoot, it's time to shoot. Just as you could use a break, it's time for some lecture material. At every firearms handling exercise, each of the fundamentals is repeated and your proper execution verified as the new material is layered on top. As the drill continues, the instructors work the line, helping the students as necessary. On the range, the instructor would talk about the next technique for several minutes. Then he would take questions. Then he would demonstrate the technique, often with a couple different types of firearm, and take more questions. Then the class would go to the line and practice the technique, getting adjustments and suggestions from the instructors. Then back to the seats to add another skill. Then back to the line to review the first skill and add the next one. It was an highly effective series of iteration and repetition. It's important to not let the effectiveness of the technique cloud the value of the instructor. Our primary instructor was running his first class at Front Sight. The shotgun range master acted as coach and assistant, though he rarely needed to step in. The instructor's knowledge of the material was complete and his presentation more than competent. Once again, Front Sight's concern for the customer was clearly demonstrated -- they had obviously worked with our "rookie" instructor to the point where we wouldn't have known if they hadn't told us. 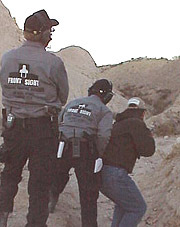 Instructor Mike Havas demonstrates the proper technique: Ready, fire, reload. In the classroom, a variety of important topics were covered, most of them presented by Front Sight's founder Ignatius Piazza. His presentations were smooth and practiced and well-delivered. The material was important and pertinent and interesting. The combination of important material that was well presented was nearly compelling. Topics included: Moral and Ethical Decisions with the Use of Deadly Force, Color Code of Mental Awareness (worth the cost of admission alone), Criminal and Civil Liabilities, the Five Levels of Competence, and Dry Practice Procedures. Ignatius Piazza has grander plans. The architect's model has apartment-style housing, full-scale home sites, celebrity training compound, private ranges and other features to make it a complete firearms friendly resort community, not just a training facility. Lunch time each day includes an optional presentation on the progress of the resort efforts and the Front Sight First Family program. The First Family program allows you to buy-in to member status, lowering the overall cost of your training and making it possible to keep your training current. More detail about the resort plans are available at their web site. Yes, both days involved a bit of a sales pitch, but they were clearly marked as being sales material and clearly marked as optional. There was a clear (and ethical) delineation between the "pitch" material and the class material. You can tell that we had a blast at our training class, that we learned a great deal, and were impressed by the experience. Is there anything we'd change? Well, we'd post the standard safety rules on each range -- you just can't read that material often enough. We were a little surprised that they used live ammo for the lecture part of the range teaching. It was creepy to see live ammo chambered a few yards away from you when not on the firing line and when no one was wearing any hearing protection. But those are nits at best (and we put them on our evaluation forms). The ability to perform on demand, exactly, what you are teaching to the students. A strong desire and ability to impart your knowledge and expertise to the students. A memory that allows you to always remember what it is like to be a student. If you want training and you aren't simply prepared to take our word for it, at least make sure that Front Sight is on your list of facilities you evaluate before spending your money, and, more importantly, your time. Because we were there to check out Front Sight for an article as well as take a class, we talked to our classmates about their experiences. Several of them had been to Gunsite and Thunder Ranch, but were now devoted Front Sight attendees (they were all on at least their second class). 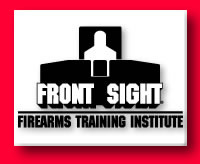 While we don't doubt that there are other good facilities and other good instructors, we're pretty sure Front Sight is a safe bet on both counts.